Military doctors prescribed several drugs: the painkillers Vicodin and Percocet and the steroid hydrocortisone. Then, in April 2003, they ordered the heavily medicated soldier deployed to Iraq. For the next year, Eggemeyer drove a Humvee, running supply convoys all around the country. His convoys were attacked twice. His worst day occurred early on, when the military truck in front of his Humvee hit a civilian vehicle. “One of the cars in the oncoming traffic hit another car that was coming toward us and caused that car to swerve across the intersection and slam into the truck in front of me. The truck in front of me hit it pretty good and killed everyone inside,” he says. He slammed on the brakes to avoid adding his Humvee to the pileup. Then he got out and loaded an entire family of dead Iraqis onto an American helicopter. “A Black Hawk had come in when my first sergeant called the medics, and they flew, and the people got taken out,” he says. “But they were already dead, and so they just got transported: a little girl, two adult females and a guy.” After that, Eggemeyer’s condition worsened. The longer he stayed in Iraq, the worse his body felt. He also started to take more of the painkillers and the steroids the military had given him. The more he took them, the more he needed to dull the pain. But violence wasn’t the only thing Eggemeyer had to deal with overseas. While he was in Iraq, he filed for divorce. Then Eggemeyer checked his bank account, and, he says, $7,000 had somehow gone missing. So, for the duration of his time in Iraq, Eggemeyer’s parents took custody of his son, Joseph, who had been born just two months before his deployment. Returning to Fort Bragg in April 2004, Eggemeyer was quickly discharged from the military. Already experiencing symptoms of post-traumatic stress disorder, he started fighting with his captain and was given a “general discharge under honorable conditions,” which allows him to use the services of the Department of Veterans Affairs but denies him access to benefits of the GI Bill. Eventually, his PTSD and other injuries led him to become homeless, and he filed a disability claim with the VA. He continued to live literally on the street, sleeping in vehicles, for more than nine months as the VA bureaucracy sorted paper and asked for more, piling delay on delay. Eggemeyer’s treatment was not unusual but routine. Wounded veterans returning home from Iraq and Afghanistan are met with years of delays as they fight with a hostile Department of Veterans Affairs bureaucracy for the disability benefits they were promised for their service. These newly returning veterans, almost 300,000 of whom have filed disability claims, are forced to wait — from six months to two years — to learn if they qualify for benefits. Those who appeal a VA decision to deny their disability claims have to wait an average of 1,608 days, or nearly four and a half years, for their answer. During this process, veterans often fall through the cracks into homelessness, hopelessness and self-medication with alcohol and illegal drugs. It doesn’t have to be this way. If the VA simplified its claims process to approximate methods used in other federal agencies, including the IRS, many more veterans would likely land on their feet quickly. “This is not rocket science,” says Linda Bilmes, a professor at Harvard’s Kennedy School of Government. “This is not as difficult as fixing Middle East peace or fixing our Iraq problem. This is something that is entirely within our ability to fix. Kare-Pro had a decidedly upscale clientele. Located right outside the gates of the exclusive PGA Country Club and down the street from the private Legacy Golf and Tennis Club, it serviced Lexuses, BMWs and large American SUVs. So less than a year after serving his country by driving a Humvee in a war zone, Eggemeyer was wiping down cars for the rich. It did not go well. “He asked a lot of questions,” Askins tells me. “He didn’t seem to get (detailing) down as quickly as some of our other workers. He had some difficulties, but we did the best we could to get the most out of him.” Eggemeyer says his main problem was that the manual labor at Kare-Pro was aggravating the injury he sustained in training at Fort Bragg. “My back started to get worse and worse, and I’d almost be crying from the pain in my back and the way my shoulder feels and my wrists. I was just having pains all over my body,” he says. In December 2006, Eggemeyer filed a disability claim with the VA; he had already lost his apartment and begun living out of his girlfriend’s 1999 Ford Explorer. When the VA responded to his claim with a letter to his old address requesting that he come in for a physical, he missed the appointment. It’s a vicious cycle familiar to homeless people across the country: They need help from the government because they don’t have a home, but they can’t receive mail because they don’t have an address. Eggemeyer pawned everything he could: his girlfriend’s ring, his guitar, his Xbox video game system and his television. Then he went to get help from Tony Reese, a veteran service representative working for Martin County, Fla. Reese let Eggemeyer use his office as his address and made sure that Eggemeyer showed up at all his appointments. He put all of Eggemeyer’s documents in order and used the VA computer system to check that his claim was on the right bureaucrat’s desk at the regional office in St. Petersburg, Fla. So Reese started to raise money from private organizations, just enough to keep Eggemeyer afloat until his claim was settled. In June 2007, he convinced the William J. Peterman Foundation for Disabled War Veterans to donate enough money to put Eggemeyer up in a cheap hotel for the month, with both Reese and the foundation believing he would surely be receiving a disability check by month’s end. All the VA needed to do was have a claims adjuster stamp a decision on his file — and since Eggemeyer was homeless, his file theoretically should have been at the top of the stack. But after 30 days passed, the VA still hadn’t rendered a decision. The Peterman Foundation money ran out and Eggemeyer had to go back to living in a car. Then, on July 21, 2007, Eggemeyer crashed his girlfriend’s Explorer, which was also his house. According to a report from the Stuart, Fla., police department, no other vehicles were involved. Eggemeyer simply veered onto the sidewalk and struck a utility pole near a Winn-Dixie grocery store on State Route 5. Reese sprang into action again, persuading the local Veterans Council, a membership organization of groups like the .org/homepage.php">American Legion and the Veterans of Foreign Wars, to pitch in enough money for Eggemeyer to buy a used truck to live in. Then they waited again. July passed, August passed and Eggemeyer was still waiting, unemployed and homeless. On Aug. 30, 2007, I called him on the telephone. “Well, about a week after that, I called them again and said: ‘What’s the process? Have I been rated yet?’ And they said: ‘Well, no. You’re missing these three forms. They’re missing from your file. You need to send them in for your file in order for them to be rated.’ So I went in to see the veterans service officer (Reese), and he helped me get the paperwork they said I was missing, and we faxed it over to them. At that point, Reese called all the claims adjudicators he knew at the rating board in St. Petersburg. He reminded them of what they already knew from the forms he had faxed and mailed them multiple times: Spc. James Eggemeyer had served his country in Iraq and had sustained both physical and mental injuries in the field of battle; he was now homeless and suicidal. On Sept. 5, 2007, a claims official at the VA told Reese and Eggemeyer that the first check would come within the week. Eggemeyer had been given a 100 percent disability rating, retroactive to the date he made his first claim, meaning he would get a lump sum of close to $30,000, plus about $2,700 a month. The VA’s own statistics show that Spc. James Eggemeyer received what could best be described as standard treatment. Since the start of the Iraq war, the backlog of unanswered VA disability claims has grown from 325,000 to more than 600,000. In the six months ending March 31, 2008, a total of 1,467 veterans died waiting to learn if their disability claim would be approved. Roche should know. When he retired from the Air Force in 1969, he went to work for the VA as a claims specialist, deciding which veterans should and should not receive benefits. He quit that job after three years, citing a toxic bureaucratic culture, and spent the next 15 years working as a veteran service officer in Pinellas County, Fla., carrying out job duties similar to Reese’s. Over the years, he has learned a lot about the VA and has written three books designed to help vets deal with it: The Veteran’s Survival Guide, The Veteran’s PTSD Handbook and, most recently, Claim Denied! How to Appeal a VA Denial of Benefits. The whole claims process, Roche says, is designed to ferret out veterans trying to cheat the system, rather than compensating soldiers injured in the line of duty. The VA requires a veteran to prove all his or her injuries, complete with dates, times and independent medical verification. For example, a veteran applying for compensation for post-traumatic stress disorder must submit a 26-page form, the key to which is a detailed essay on the specific moments when he or she experienced a terrifying event or series of incidents that caused his or her mental illness to develop. This is not easy. One of the primary symptoms of PTSD is the tendency of those who suffer it to block out any memory of the event or events that led to the disorder. According to the Diagnostic and Statistical Manual of Mental Disorders, the bible of psychiatric diagnoses, a person with PTSD often displays a “persistent avoidance of stimuli associated with the trauma and numbing of general responsiveness.” In other words, the last thing a person experiencing post-traumatic stress wants to do is sit down and write an essay on why, and exactly how, he or she has become mentally ill.
Veterans must also back claims up with documents proving their PTSD is “service connected,” get their paperwork past a predetermination team at one of the VA’s 58 regional offices and sit for a Compensation and Pension Medical Examination with a doctor whose entire job is to detect fraud. After the exam, the veteran’s case goes to a VA rating board. By now, months have been spent on paperwork, and the veteran still has no idea if benefits will be granted. If there is a disagreement between the veteran and the rating board, another even-more-complicated appeals process ensues, and it could take years before the veteran receives a check. It’s here that Roche and other veterans’ advocates see the biggest problem. The VA promotes claims adjudicators based on how many cases they clear, not on whether they make the right decision. “A VA claims official is required to clear 12 claims a day,” Roche notes. “If they deny your claim, they can take an ‘end product credit.’ So as far as statistics go, they have cleared a claim. The cost of easing the readjustment process for veterans would be relatively small, about $500 million a year, or about 2 percent of what Congress appropriated last year for the war in Iraq. Great Britain, Australia and New Zealand all use similar systems to compensate their injured veterans. Yet very little has been done to push this plan toward implementation. No member of Congress has sponsored legislation that would enact this solution. The VA has tried to tackle the long wait times by hiring thousands of new civil servants to process disability claims under the current system. But Bilmes says this strategy is bound to fail. So far, the backlog continues to grow. “You will have several thousand more inexperienced claims adjudicators who all need to be trained,” she says. “In the interim, we will have to pull off the more experienced claims adjudicators to train the less experienced ones, and if we’re really lucky, that will reduce wait times by 20 percent. On Florida’s Atlantic Coast, former Spc. James Eggemeyer continues to try to get his life together. Back and shoulder pain, coupled with post-traumatic stress disorder, still prevent him from holding a job, but the disability payments he’s received for the last year have allowed him to move into a trailer park. He’s become active in his son’s life again. He’s beginning to make the readjustment to civilian life that could have begun months earlier, if the government that sent him to fight in Iraq had trusted him when he came back. Aaron Glantz reported extensively inside Iraq from 2003 to 2005 and has been covering veterans’ issues since his return home. He is author of How America Lost Iraq. Aaron Glantz reported extensively inside Iraq from 2003 to 2005 and has been covering veterans' issues since his return home. He is author of How America Lost Iraq. 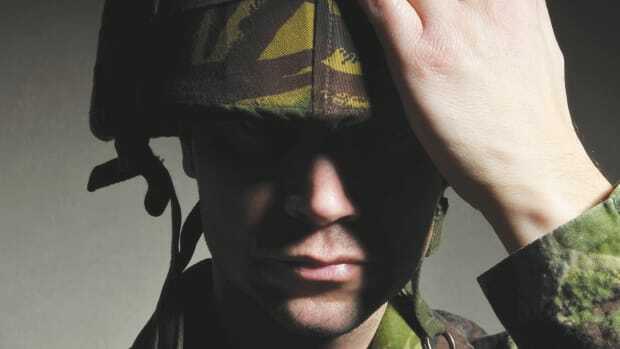 A Veterans Administration psychiatrist and researcher offers a revamped model for treatment of returning soldiers that looks to training and education as much as therapy and pills.